As a child I wasn’t crazy about vegetables with one notable exception. I loved artichokes. My mother served them with lemon butter or garlic mayonnaise and upon retrospect I think that was in no small part why I loved them so much. All other vegetables were served plain, but artichokes got the royal treatment, and frankly, what isn’t better with a dip in lemon butter or garlic mayonnaise? 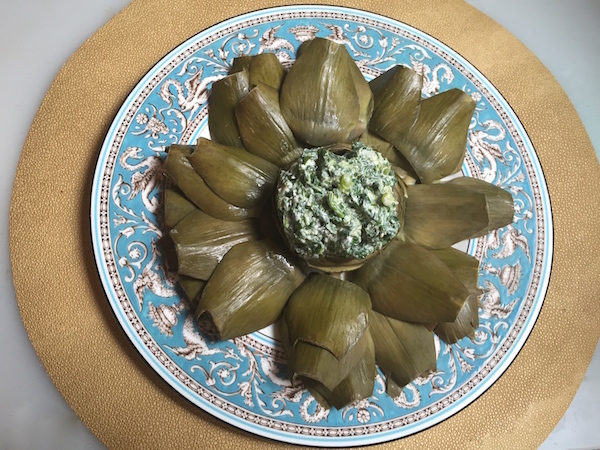 There’ s a popular dip with canned or frozen artichoke hearts. spinach and loaded with cheese and mayonnaise. I’ve remade the recipe, creating a creamy dip made with fresh spinach, herbs and Greek yogurt. Dip the artchoke leaves and heart into the dip and you get the flavor of that dip but in a much fresher, lighter and healthier way. Artichokes are good hot or cold and are a very good source of dietary fiber, vitamin c, vitamin k, folate and manganese and a good source of niacin, magnesium, phosphorus, potassium and copper. They do require a little prep work. You need a good pair of kitchen shears to trim the thorny tips off the leaves, I also remove a few of the tougher small leaves on the base of the artichoke and use a paring knife to trim the stem just so it will stand up during cooking. If you are only making one artichoke, you can easily prepare it in the microwave. Simply trim the artichoke and place it stem side up, along with 1/4 cup of water in a soup mug or cereal bowl. Cover with microwave safe plastic wrap and microwave for about 6 minutes. It’s that easy! If you’ve never cooked artichokes before, now would be a good time to start. 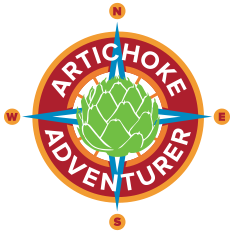 Ocean Mist Farms is running the Artichoke Adventurer contest. Upload a picture or video of yourself cooking or eating a fresh artichoke – even if it’s your first time – for a chance to win a trip to Monterey, California for the 2016 Castroville Artichoke Food & Wine Festival June 4 - 5, 2016 for you and a friend. The grand prize will include a travel and lodging from June 3 – 6, 2016, admission to the Artichoke Festival, and $1,800 in gift cards to enjoy other experiences in Monterey, such as wine tasting, kayaking, museums and more. Your entry will be judged based on creativity of your photo or video, and how well you show off your adventurous spirit. Trim the thorny tips of the artichokes and any small tough outer leaves at the base, If you have a pressure cooker, use a steamer basket and cook with a cup of water, under high pressure for 10 minutes. If you don’t have a pressure cooker, steam them for about 40 minutes, or untll the leaves can be plucked with a gentle tug. Let cool. Bring a large pot of water to a boil. When the water comes to a boil, add the spinach and blanch for 10 to 20 seconds, just until wilted. Transfer to a bowl and run cool water over it until cool to the touch, then drain and squeeze very dry. Finely chop the spinach or place the spinach in a food processor and pulse. Transfer to a bowl and mix in the garlic powder, salt, olive oil, green onions, herbs and yogurt. 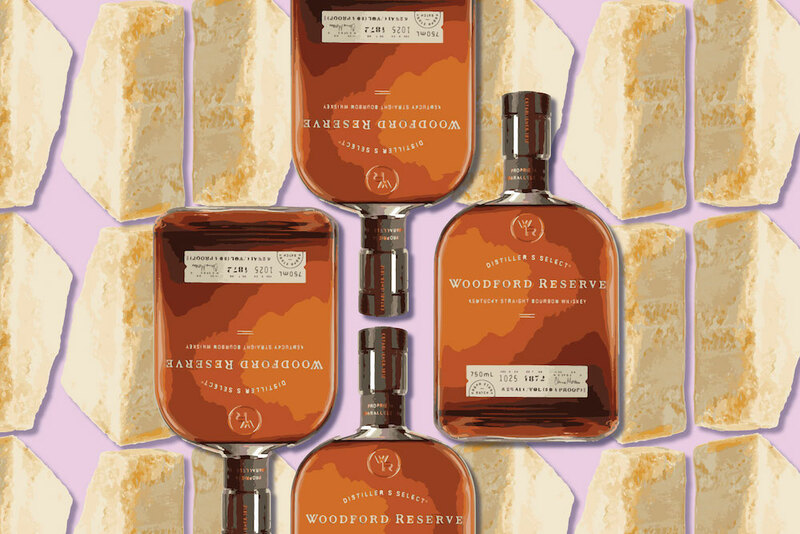 Season to taste with fresh pepper. Serve the artichokes with the dip. Disclaimer: I received artichokes from Ocean Mist Farms, I was not compensated monetarily for this or any other post.